The main suspect in the murder of an American kindergarten teacher in the restroom of an Abu Dhabi mall has been arrested and is in police custody. Victims of the attacks were picked based on the color of their skin and their nationality and apparently, the suspect’s home was a base of terror operations. Good job, UAE. First you put CAIR on your list of terrorist organizations, now you quickly apprehend the killer of the teacher. UK Daily Mail A woman suspected of stabbing an American teacher to death in an upscale Abu Dhabi mall has been arrested during a dramatic night-time raid. The ‘face covered’ suspect is an Emirati national in her late 30s, said Sheikh Saif Bin Zayed al Nahyan, the minister of the interior for the United Arab Emirates, at a press conference on Thursday. Her name was not released. This as UAE police have also told ABC News that the suspect was ‘not lone wolf’ and her house was ‘a base of operations’. 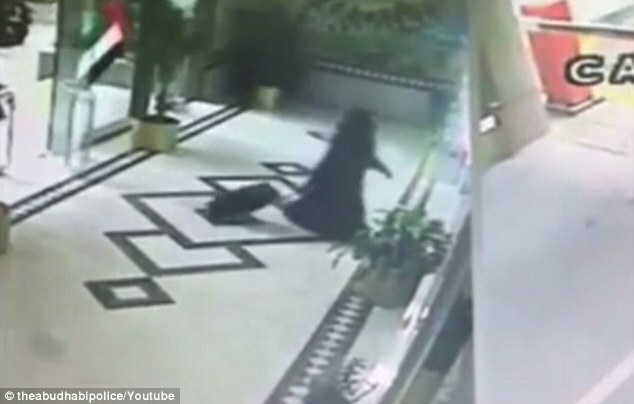 The woman was wearing a burka when she allegedly stabbed 47-year-old mother-of-two Ibolya Ryan, who once lived in Colorado, in a mall restroom on Reem Island on Monday. An hour after the stabbing, the suspect then planted a home-made bomb outside the house of a Muslim Egyptian-American doctor, Sheikh Saif said. But the device, which was made of small gas cylinders, a lighter, glue and nails, was successfully dismantled after one of the man’s sons found it. Sheikh Saif added that the woman targeted her victims based solely on their nationality and did not know either of them. He said she ‘aimed to create chaos, shake the security in the country and terrorize people in the UAE’ – although investigations are still continuing into her exact motive. On Thursday, authorities released dramatic video footage showing the suspect’s arrest during a night-time raid. It shows a SWAT team swooping on the home at night and bursting through the front door – forcing a man to the ground at gunpoint and dragging the woman away in handcuffs. 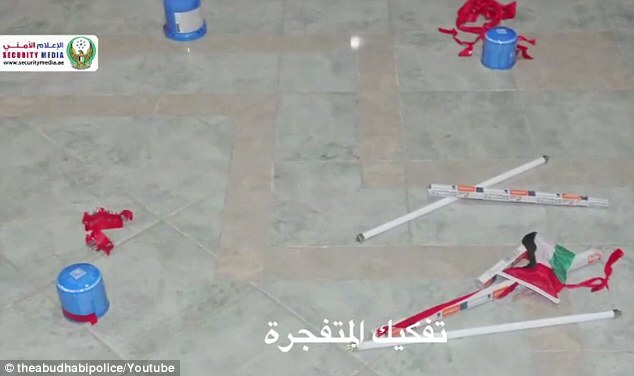 The footage, which was released by Abu Dhabi Police, also shows images of what appear to be home-made bombs at the house, as well as stashes of knives. There are also shots showing the same white SUV that the suspect was seen driving from the scene of the crime. Blood can be seen on the steering wheel and a black suitcase – identical to the one she allegedly carried to the doctor’s apartment – are also shown in the police video. The teacher was stabbed to death by an attacker wearing the black veil commonly worn by women throughout the Gulf Arab region. 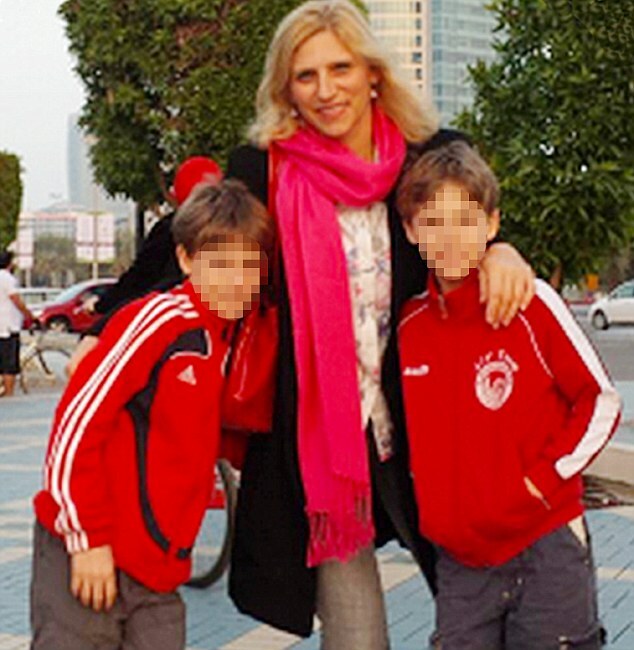 Witnesses told MailOnline she was stabbed as many as six times. Detectives previously released CCTV footage which showed how the suspect lay in wait for the teacher for an hour – which suggested the attack was a targeted murder. 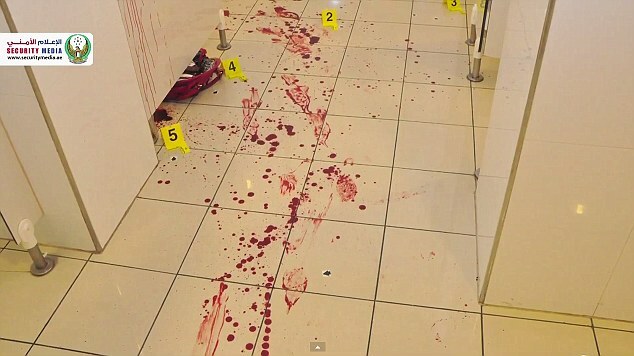 Mrs Ryan, who was Hungarian-born, raised in Romania and trained as a teacher in the U.S., was left in a pool of blood after what police said was a ‘brawl’ in the toilets of the upmarket Bourik Mall. As security guards rushed to the scene of the killing, her attacker calmly got in an elevator and walked out into the car park. The assailant left behind the weapon, a large kitchen knife. In the newly-released video, the suspect is then seen heading towards the doctor’s home with a small black suitcase. A security guard said he saw her enter and then leave quickly. 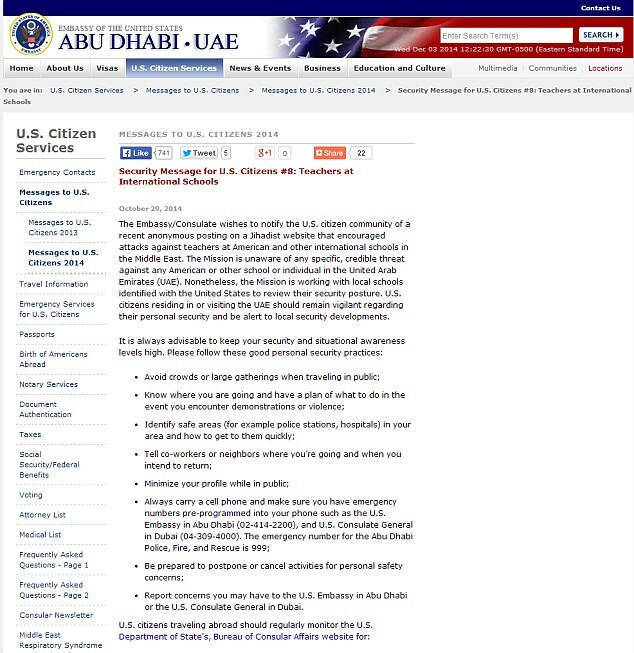 Warning: What teachers in Abu Dhabi were told a month ago by the US Embassy to the United Arab Emirates. 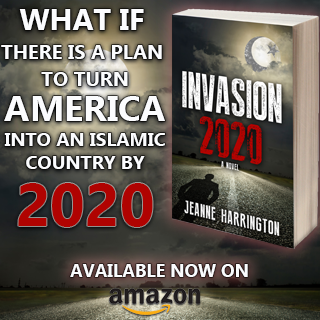 It said jihadi websites wanted American teachers to be attacked. The bomb was spotted when the doctor’s son was going to mosque in the evening to pray and noticed the strange object in front of the house. Colonel Rashid Bourshid, head of the criminal investigation department, said: ‘The doctor who was targeted with the bomb, 46-year-old MH, informed the security guard about the strange package in front of his door. With the footage of the killer walking down the street in the jerky fashion I was reminded of the Blair Witch Project and other similar films. They look like ghosts or witches dressed in black, and not out of place in the wardrobe in the Conjuring. I am not convinced it was a woman who committed the murder though and I believe the woman was arrested in an effort to soothe tension in the Western media. The woman will be executed and a “line drawn under the issue”,yet the real killer is still out their lurking and plotting further murders. burga should be banned. the cctv footage appeared to be indicating a burga clad man not woman…watch again previous cctv footages. what is the death penalty in the UAE for this kind of crime? behading by sword jhatka saudi style or pay money to victim’s family. It will happen in our countries. So easy with the burqa that should be illegal. Everything is easy with the burqa or nikab. A public beheading would be nice. The ethical UAE and Egypt fight against the terrorist organization, Muslim Brotherhood. The Obama regime place them into positions of enormous power inside the government. Moderate and radical factions?! Horse shite! 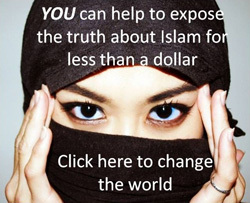 THIS sort of thing IS islam in its truest form! Great, UAE. Now stop funding fundamentalism. No one will come to your rubbish countries now anyway and your property and land will be worthless. Reap what you sow. 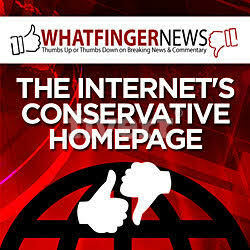 I agree… good job for banning the Muzz-maggot brotherhood and arresting the murderer of the American teacher. I would add another thing to that list. The UAE authorities also if you noticed ACKNOWLEDGED that the muzz-sow was NOT a “lone wolf” and was in fact living in a home that was a base for terror operations. Yet, the Western media will say “lone wolf” ad nauseum. Why? So the public won’t realize that all of this terrorism, sharia enforcement and muzz supremacy is organized? Yet, we have some honesty… the UAE admitting that this female jihad-whore was NOT a lone wolf but part of a bigger group to attack Westerners and destabilize the UAE. I wonder what punishment she will get? They have capitol punishment in UAE..also for apostasy. You can be sure she’ll be punished way more harshly than she would be here. Has Obama deemed this “Shoppingplace Violence” yet? He will ignore this story, as always. ALL Americans should leave the Middle East. Let it implode on it’s own. I cannot fanthom any typical Americans who would still be there. I really though it’d end up being a dude. Freaking nuts! Death to the jihadists and islam! “investigations are still continuing into her exact motive”. Notice that she isn’t wearing the hijab while being taken out after her arrest. This use by both women AND men to hide their identities in order to commit crimes, should be enough to have them banned everywhere.